Porcelain was first made for use in high tread areas, but its technical and aesthetic properties have made it an extremely versatile product, ideal for application on both walls and floors. The possibility of eliminating the defects of natural materials (such as porosity, potential cracks, foliation or variations in colour) has rapidly made porcelain a product characterised by unrenounceable morphological and aesthetic performance. Moreover, its near total inabsorbency makes porcelain preferable to other ceramic products, guaranteeing uncommon resistance not only to tread, scratching, temperature excursions and mechanical stress, but also to ordinary maintenance with chemical products. Porcelain floors and walls find applications in a great variety of sectors, from residential projects to community facilities such as schools and hospitals, and from public and commercial places to outdoor spaces. The brands in the Iris Ceramica Group, a market leader in Italian-made porcelain, point the way in innovation with ceramics, guiding the styles and trends of contemporary design for all possible applications of porcelain, also for surfaces such as kitchen and bathroom countertops, tables, sliding doors, wall-hung cabinets and ventilated walls. In recent years, as demonstrated by the Group’s regular participation in all the most important trade fairs and exhibitions, the companies in the Group focus on creating harmonious, coordinated spaces capable of inspiring architects, planners and interior designers with total look solutions. 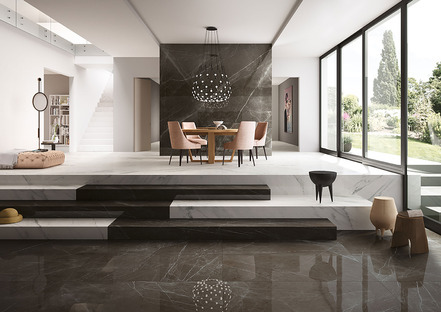 One example of this design concept was offered by Fiandre Architectural Surfaces’s recent participation in the 2019 edition of LivingKitchen in Cologne, an international trade fair for kitchen furnishings, along with a number of other brands in the Iris Ceramica Group (including SapienStone, FMG Fabbrica Marmi e Graniti and Iris Ceramica). In a stand designed by duePIU architects and "characterised by a minimalist, emotional compositional vocabulary", Fiandre Architectural Surfaces presented a number of the most refined and innovative surfaces in its Marmi Maximum line. Easily worked Maximum maxi-slabs (measuring 300x150 cm and only 6 mm thick) allow designers to enjoy the utmost freedom of expression. On the basis of a number of today’s principal interior design styles, the collections permit coordination of floors, furnishings and wall coverings in response to clients’ needs and desires. The collections Fiandre showcased at LivingKitchen, presented in the gallery here, represent some of the most popular solutions on the ceramics market. 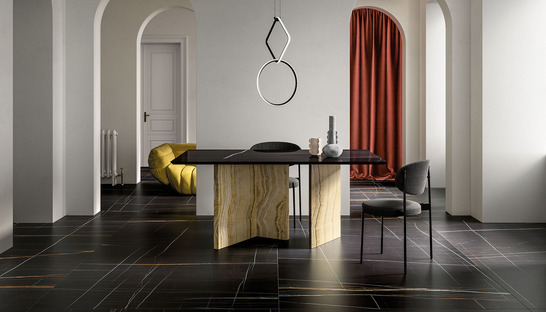 Presented at Cersaie 2018, Sahara Noir is inspired by one of the world’s most prestigious and expressive black marbles. Two finishes (satin and polished) create a dark surface with subtle inclusions, inspired by the colours of the African desert that gives the collection its name. Stripes reveal a sophisticated design in a decorative, almost pictorial spirit, simply conveying a fascinating world of elegance and extreme formal cleanliness. The attractive luminescence of Premium White adds a precious touch to contemporary and classic spaces with the refined atmospheres that only the best white marbles can convey. Silvery stripes and veins flicker quickly and delicately across the bright white surface of Premium White. These precious, original details add light and warmth not only to the natural white background of the wall covering, but to the space as a whole, with surfaces revealing the ancient stratification of the rock, the purity and charm of the incessant work of time. After the chiaroscuro of the previous collections, in Glam Bronze GranitiFiandre explores colours coming from red earth, enriched once again with subtle, irregular light and dark marks, almost like embroidery. The basic colour is warm bronze. The sophisticated mood of its "polychrome harmony" is equally inspiring in residential spaces with a metropolitan flavour and in commercial spaces and business premises. With its slate grey background, Pietra Grey is a particularly refined surface of unique style. With "crystalline veins giving the product a harmonious look and highly versatile potential, in terms of both taste and application", Pietra Grey adds value to architecture and interior design projects in every room in the home. 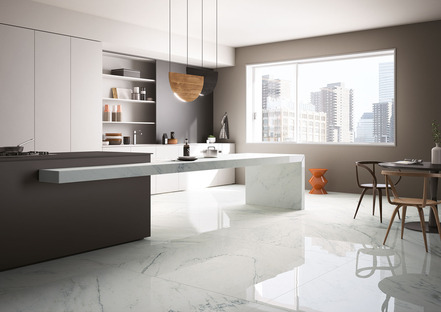 Calacatta Statuario is a surface in pursuit of classic, exclusive style, a solution featuring original shading with colours in different degrees of intensity. Its inimitable ivory white colour with grey veining allows Calacatta Statuario to create a sensation of harmony and balance, adding a precious touch of light to spaces both public and private.